Are planning for a BWCA canoe camping adventure ? If your dream vacation is to get away from it all, avoiding the crowds and getting deep into nature – then a BWCA canoe camping adventure is perfect for you! Canoeing in the remote BWCA backcountry you will be able to start your trip at various locations and get quickle into the wilderness. 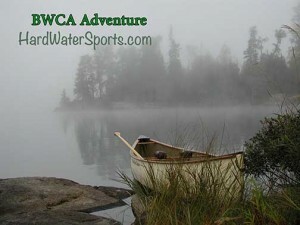 We can help with the details of your Boundary Waters adventure. With lightweight tents and camping mats, as well as canoes and the other stuff that are make your wilderness experience pleasurable. We can help you to pick an entry point and canoe rout that matches the abilities and interests of your group. From reserving the required permits to picking out meals – the staff at Hard Water Sports can help with the details of your canoe camping adventure. or call 651-302-1774 and ask for Tony in the rental dept. BWCA Trip Planning where to go and what to bring for your next BWCA adventure. Picking an Entry Point – What You NEED to Know – Hard Water Sports can help plan your next adventure. Call, we’re here to help. BWCA – Frequently Asked Questions? Happy Camping– 5 secrets to a Happy Campsite.